This plug-in is only compatible with SLDataText v4.2.0 and higher. This is a simple Combat Monitor module plug-in for SLDataText. - Left Click: Clear that saved value. 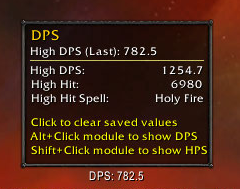 - Alt+Click Module: Show DPS related display. - Shift+Click Module: Show HPS related display. Inherits all other SLDataText related features, including configuration. Use '/sldt CombatMonitor' to access menu. This is my first leap into a monitor-type module. Please forgive any bad math or erroneous information the module provides. Also, I'm very interested in feedback for additional features for this module. Love it, i really dislike running things like skada or recount, cause while they provide tons of data, it hits my old computer. 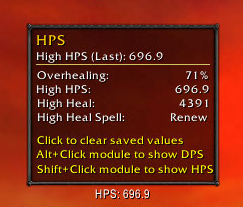 Some minor additional features would be cool, short values, 23.5k instead of 23500,0 and removing the decimal if possible "23k" rounding up at like 23.6k perhaps, also switch from dps to damage done, and hps to healing done, and maybe possibly to show all 4 at the same time?.